The church is a member of the Greater Churches Group and is the largest parish church in Shropshire. It was one of only 18 churches given a five-star rating in England's Thousand Greatest Churches by Simon Jenkins (1999) and is described as the "cathedral of the Marches". The tower is 135 feet (41 metres) high and commands excellent views of the town and surrounding countryside. 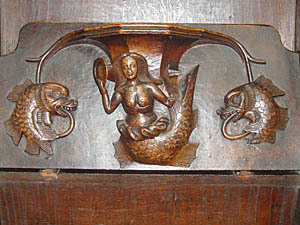 Notable features include an extensive set of misericords in the choir stalls as well as fine stained glass windows. St Laurence's is a Church of England parish church and is an active place of worship. After its initial Norman construction in the 11th Century AD, the church was expanded and rebuilt in 1199 to accommodate Ludlow's growing population. 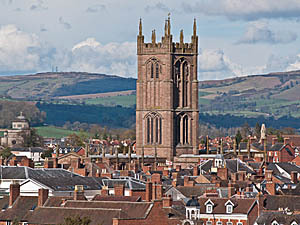 During the late Middle Ages Ludlow became a wealthy wool town, to befit this growing prosperity St Laurence's underwent several further additions. The major works occurred between 1433 and 1471 with a virtual re-building of the nave, tower and chancel elements. The tower took on a Perpendicular style which was fashionable in England in the 15th century. The large east window of the chancel underwent restoration in the year 1832; this window depicts the martyrdom of St Laurence. The most extensive modern repairs and rehabilitation occurred in the period 1859 to 1861, which consisted primarily of interior modifications. Further major restorations took place between 1870 and 1909, including that on the tower in 1889-91, and to the roof in 1953-59. The dominant exterior feature is the square bell tower, designed in the English Perpendicular style, the tower is 135 feet (41 metres) high and houses the historic bells of the church. 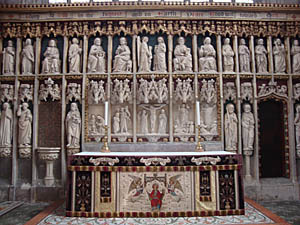 The chancel contains the medieval choir stalls adorned with numerous misericords. Below the chancel are the catacombs, which hold an impressive set of church monuments, most of which contain the remains of people involved with Ludlow Castle’s Council of the Marches. Other than the large chancel east window, there are other notable windows within the chancel; the most remarkable one depicts the Ten Commandments, illustrating six of the commandments being broken. The hexagonal south porch dates from the 14th century and serves as the main entrance to the church. The porch contains the parish war memorial, listing those who died serving in World War I, with deaths from World War II and the Korean War added later. Above the porch on the first floor is the Parvis room, which houses a small museum. A number of helpful guide books and leaflets in various languages are available inside the church.